Wait, didn’t Cinderella say that? The band, not the Princess. Regardless. James Kottak has occupied the space behind the drum kit for the band since way back in 1996, and recently he took some time out of his very busy schedule in order to talk with me, quell my concerns and assure me that, among other things, the world was not going to implode with the impending end of the Scorpions. Get eXposed Music: So, you’ve been manning the kit for the band since 1996, and have been involved in a handful of records. Tell me about your time with Scorpions. James Kottak: It's been AWESOME! I've played on six studio albums, six or seven DVD's & toured the planet about 20 times over. Not bad for a kid from Louisville, KY! GE: Do you have a favorite moment or memory with the guys? Something you wish to share (I hope)? Kottak: I remember my first show with the Scorps. It was in 1996 in Albuquerque, NM. There was so much preparation for the tour that it didn't hit me until I was onstage. I'm PLAYING WITH THE SCORPIONS. It was a surreal moment. Being inducted into the Rock Walk of Fame in Hollywood this past April was bitchin’ too! GE: Tell me about being enshrined in Hollywood’s Rock Walk. What was that experience like, and how did it come about? Kottak: I don't know how it came about. All I know is that I will never forget that day. It was almost like I was watching myself acting in a movie...UNBELIEVABLE...a true honor! 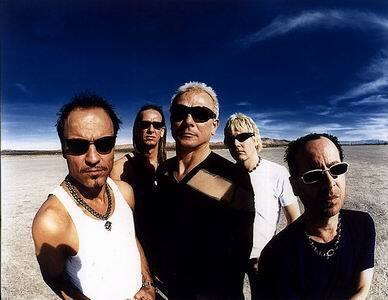 GE: How did you initially come to decide “Sting in the Tail” was going to be the bands final record? What was that conversation with the band like? Was there crying and hugging and such, with ‘Winds of Change’ playing in the background? Well, that’s how I’d picture it at least. Kottak: HA! whistle...We've been talking a bit over the last year here and there...it just feels like the right time. We feel it is better to go out with a bang than wither and fade away. At this time it is hard to picture the LAST show as we're just gearing up for the SITT world tour. GE: Speaking of ‘Sting in the Tail,’ walk me through the recording process of the record. Kottak: We recorded almost all the songs at Rudolf's studio about a year ago, then we wrote some more just recently. In August Michael (‘Nord’ Andersson) & Martin (Hansen), the Swedish producers came in and we started from scratch. What started as a dark & moody album turned into one of my favs of all time thanks to them! GE: How did you decide on a producer? After all these years, did you have people knocking down your doors for the job? Kottak: A lot of big names were considered, but, it just felt right w/Michael & Martin. They are songwriters as well as band guys which is VERY important. GE: Was there anything left to prove for the Scorpions with this record? What was left for the band to say? Kottak: Rock & roll is very competitive so there is ALWAYS something to prove. We can still throw down! As far as having something to say, let's say it does get harder when you are on your 17th album. People expect the new ‘Wind of Change’ or ‘Hurricane.’ It can be a lot of pressure. GE: How is it, that nearly five decades into their career, the band can sound this good & this fresh? “Sting in the Tail” is a very good record – how is that possible at this late stage in their game? Kottak: They have a GREAT drummer! (laughs) We love what we do. It is not a job, except for the traveling. Rock & roll is our life next to our families. GE: Can you tell me about the song ‘the Best Is Yet to Come?’ As I listen to the lyrics, it sounds as if this song is saying goodbye to all of your fans? Or am I just reading far too into it. Kottak: Hmmm, I'll have to check the lyrics out again. I like the chorus – its very positive! GE: With just how good this album is, don’t you listen to it and just say, ‘guys, we should record one more’? I mean, you sound as if you have gas left in the tank. Kottak: That is the problem when you are obsessed with rock and roll. You always want more. It is the best drug in the world. That is one main reason I have my band Kottak. It is a creative outlet that I need when I am not doing Scorps. BTW,the third Kottak album “Rock & Roll Forever” will be released in Europe, May 14th (physical & digital). It will be out in North America late June. I am the lead vocalist/guitarist, Athena is on drums, Price Vernon on bass, & Johnny Lucas on guitar. I am way excited about that as well! GE: Do you plan to tour for this record? If so, how long will you stay out on the road? 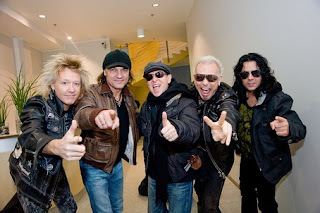 Kottak: The Scorpions tour will last 3 years if not more. Kottak will tour any time there is a break. GE: How are you coping with the idea of there being no Scorpions? What are you going to do with your time now? I mean, doing the same thing for so long, you develop a pretty good routine I’d imagine. Kottak: There will always be Scorpions, just not the band. I am looking forward to a new chapter of my life to begin. I know I will miss it, but the end is still a long way from now...It's time to get the Sting in the Tail party started! GE: If you had to, and I guess since I’m asking you have to, where would you rank the Scorpions among rock bands all time? Kottak: To me, the Scorpions are in the top 5 along with AC/DC, Rolling Stones, etc. I always aim high & think BIG! GE: On a completely different topic, have you ever played the Rock Band video game? Or do you just not bother with it? When are we going to see some Scorpions released as playable songs? As someone who plays the game very, very often, you guys have a lot of tracks that would fit in very well in the game. Kottak: I've checked it out, it's cool! I prefer a real guitar. I thought there were a few Scorpions tracks already in Rock Band? GE: Anything else you might want to say to all the readers? Kottak: See you on tour. ROCK & ROLL FOREVER. Hit me on Facebook/James Kottak, www.myspace.com/kottak, http://www.jameskottak.com/ , etc. GE: As a rock music nerd and quite possibly addict, I just have to say – I didn’t know you played drums in Ashba. Painfully underrated in my book, but I’m sure you don’t get too many people who even remember that band. OK, that will be my only un-Scorps-related comment. Kottak: I paid for & produced his first CD. GE: I can’t thank you enough for the time, really I can’t. Thanks again, for real – I sincerely appreciate you taking the time to chat with me – it means a lot to me as a longtime Scorpions fan. Thanks for everything! Kottak: You are WELCOMMMMME! YEAH!